The Google Group website also provides us with an archive of the messages that have been sent to the list, so we don't have to keep them as emails, if we don't want to. You must have a Google account before you can sign in to the Group site and access the archived messages or other features. The Google Group website will allow members of the group to upload files or create pages. Not sure how we might use this yet, but am working on ideas. 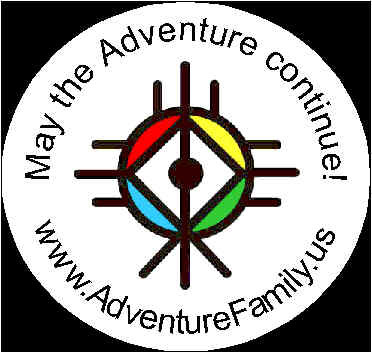 With our website domain hosting, we can have custom email addresses set up that end with "@adventurefamily.us". The first part of the email address can be anything you want it to be, such as "infoman@" or "COP@" etc. I can forward the mail to any email address you tell me to. Anyone can send an email to this custom email address and you will get it in your regular email inbox. This is a free feature that comes with our website hosting. If you're interested in having a custom Adventure Family email address set up, please contact Infoman directly. Continuing to make use of Google's free tools, we have an Adventure Family calendar hosted by Google. If you have a Google account, we can share the calendar with you and then you can view or add events to the calendar. You can also create your own separate calendars within Google Calendar and display them all at once. I use it to bring together all the things that compete for my time and then see when I'll be able to get out for another adventure!! If you use another calendar application that can read calendar feeds in XML or ICAL format, you can pull our calendar data into your existing calendar. Contact Infoman directly to be added to the list, or to get the calendar feed info. We have two companies set up to embroider the Adventurer's Logo onto just about anything they can fit in their machines. One embroiderer is in Asheville. The other is in Raleigh. Contact Infoman or SD to get in on the next batch of items to be embroidered. We must batch the items together to make a larger order so we can get discount pricing. To carry on our mission of spreading the word around the world about the Adventure Family ;) , we're having some quality vinyl stickers printed up through StickerRobot.com. We've ordered 1000 stickers. If you'd lke some, please contact Infoman and he'll get some to you. We're expecting to have them by mid-April. Here's the sticker design. They will be round, with a diameter of 2.75". 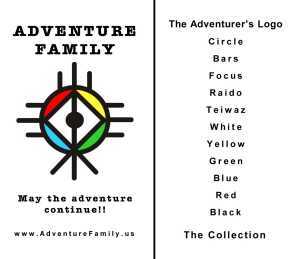 To carry on our mission of spreading the word around the world about the Adventure Family ;) , we've ordered some business cards with the logo on the front, and an outline of the logo parts on the back (to aid in telling the story). Contact Infoman if you would like some of these. The cards cost about $0.06 each, so a small donation would be appreciated to help cover the costs.